Select any three or more performances to subscribe— the more you choose, the more you save. Choose 3 OR MORE to subscribe! 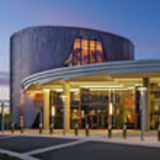 The Best of Arts & Entertainment Right in Your Backyard HYLTON PERFORMING ARTS CENTER The spectacular Hylton Performing Arts Center is the ideal venue for enjoying first-class performing arts from around the world and around the corner. In addition to the Hylton Presents series and the Hylton Family Series, the Hylton Center also presents the popular Matinee Idylls series, American Roots series, and Hylton Center EXTRA! events. It is home to Arts Partners and Affiliate Arts Organizations, and also hosts many special events and exhibitions. This exciting programming, along with the Hylton Center's convenient location and free parking have made it a favorite arts destination in Northern Virginia. On behalf of the Hylton Performing Arts Center, I’d like to invite you to explore the exciting new season. Since my arrival at the Hylton Center last summer, I’ve been busy putting the finishing touches on the 2019–2020 season. In this season, you will see the first signs of my programming fingerprints. I’m excited to introduce you to some artists making their Hylton Center debuts as well as many of your favorite artists returning to our stages. I look forward to meeting you this season! Turn to page 14 to learn all about all of the benefits of subscribing. Tickets for individual tickets go on sale August 1. Until then, tickets are available only as part of a subscription. Half-price tickets to any Hylton Presents performance are available for children and youth through grade 12. See “Important Subscriber Information” on the order form insert for details. Performances we recommend as most suitable for families with children to enjoy together are identified by this Family Friendly symbol. Most Hylton Presents performances are preceded by a lively presentation led by local experts and sometimes the artists themselves. These insightful, free forums begin 45 minutes prior to the event and provide a deeper understanding of the performance. For more information, see “Important Subscriber Information” on the order form insert. PRIME SEATS! SUBSCRIBERS GET THE BEST SEATS. The Second City Greatest Hits (Vol. 59) There is nothing quite like live sketch comedy, especially when it’s performed by the renowned satirists of The Second City. Prepare for laugh-outloud entertainment that zings with spontaneity and good fun. For 60 years, the hilarious troupe that inspired Saturday Night Live and Whose Line is it Anyway? has defined social and political satire and launched the careers of superstars like Tina Fey, Stephen Colbert, Steve Carell, Julia Lewis-Dreyfus, Keegan-Michael Key, Bill Murray, and so many more. Witness the newest crop of improvisational comics performing the Windy City’s iconic brand of side-splitting spoofs and songs in their latest show Greatest Hits (Vol. 59). “The entire recent tradition of American satire can be summed up in three words: The Second City,” (The New York Times). back up again with fiery Russian classics from the Siberian State Symphony Orchestra, the “voice of the guitar” MILOŠ, an evening of Broadway favorites featuring Grammy® and Tony nominees, the hypnotic folk dances of Ballet Folclórico Nacional de México de Silvia Lozano, and much more. These performances are held in the stateof-the-art Merchant Hall with superb acoustics, splendid views, and comfortable seating. In addition, the Hylton Presents season includes many family-friendly performances and a 50% off youth discount making it the perfect opportunity to share the arts with audiences of all ages. There’s never been a better time to subscribe and save to make the most of your experience with us at the Hylton Center this season. BIG SAVINGS! SUBSCRIBERS SAVE UP TO 30% OFF INDIVIDUAL TICKET PRICES. FLEXIBILITY! SUBSCRIBERS GET FREE TICKET EXCHANGES. American Festival Pops Orchestra Holiday Pops: Songs of the Season Just hear those sleigh bells jinglin’ as the American Festival Pops Orchestra ushers in the season with its annual holiday concert. A beloved tradition at the Hylton Center, the uplifting evening includes treasured classics like Leroy Anderson’s “Sleigh Ride,” “A Christmas Festival,” a rousing carol singa-long, and special guest artists. Maestro Anthony Maiello leads Northern Virginia’s very own pops orchestra in this lively, family-friendly evening of musical merriment. music, dance, and holiday fun! PERSONALIZED SERVICE! A HELPLINE JUST FOR SUBSCRIBERS. IT'S EASY! CHOOSE ANY 3 OR MORE HYLTON PRESENTS EVENTS TO SUBSCRIBE. 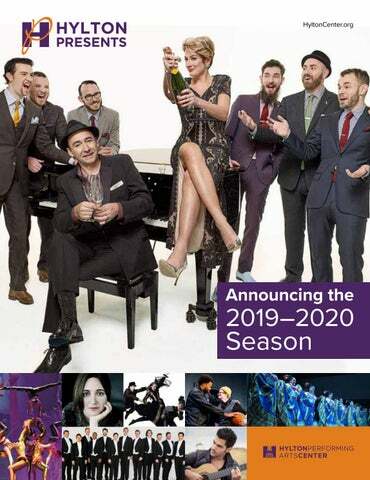 Subscribe to the 2019–2020 Season of Hylton Presents Subscribers Get More! Maximum savings. Best Seats. Enjoy all 18 performances of the Hylton Presents season, and receive a 30% discount. You also receive higher seating priority, the same seats for every performance, the opportunity to renew these seats each season, plus all of the other subscriber benefits listed to the far right. Maximum flexibility Create a personalized series by choosing any three or more performances from the Hylton Presents season, and receive all of the subscriber benefits. The more you choose, the more you save. Group Discount Groups are welcome, and we offer discounted ticket prices for groups of 10 or more. It is often used as a fun way to entertain clients or reward employees. Contact our Group Sales Office at 703-993-7758 for information. MORE SAVINGS! MORE SERVICE! MORE CONVENIENCE! MORE ENJOYMENT! Subscribe Today! Choose 3 OR MORE to subscribe! Phone: 703-993-7700 Online: HyltonCenter.org Ticket Office: Tues–Sat, 10 a.m.–6 p.m. Use Our Convenient Payment Plan Spread payments out over several months. See order form for details. All patrons must have a ticket. For Hylton Family Series only: Children under the age of two who are held by an adult and do not occupy a seat may receive a lap ticket free of charge. Individual tickets go on sale August 1. The Rainbow Fish Dive under the sea into a shimmering and colorful world of The Rainbow Fish with this heartwarming stage adaption of Marcus Pfister’s treasured storybook as well as two of his companion tales Rainbow Fish Discovers the Deep Sea and Opposites. The story sparkles on stage with the many colors of courage, opposites, decision-making, and friendship. It is lovingly brought to life by the Mermaid Theatre of Nova Scotia, recognized for its innovative puppetry, striking scenic effects, and evocative original music. The Rainbow Fish will captivate the whole family and is perfect for encouraging a love of both theater and quality literature. Recommended for ages 2 to 8 Sunday, February 9 at 1 p.m. and 4 p.m.* $15 adults; $10 children *The 4 p.m. performance is sensory-friendly and will be performed with accommodations to be welcoming for all people with autism or other disabilities that create sensory sensitivities. More information about this sensory-friendly performance is available at HyltonCenter.org. Matinee Idylls presents a fantastic “menu” of distinguished musicians presenting a colorful variety of chamber music. These afternoons are sure to delight, with a luncheon prepared by an outstanding local restaurant, followed by a one-hour concert and a coffee and dessert reception with the artists. Up-close, down-home concerts with the best of bluegrass, country, blues, and more. Enjoy a casual setting in the Gregory Family Theater with food and beverage for purchase. Terra Voce Featuring Maria Yefimova, piano Comprised by flutist Elizabeth Brightbill and cellist Andrew Gabbert, Terra Voce is known for its eclectic and genreexpanding programs that mix classical, traditional folk, and even tango music to showcase the delightful chemistry between the flute and cello. Terra Voce has appeared on the Millennium Stage at the Kennedy Center, in the Christ Chapel Chamber Series at New York City’s Riverside Church, and as finalists in the National Flute Association’s Chamber Music Competition. Internationally celebrated pianist Maria Yefimova collaborates with Terra Voce in this engaging program. Yefimova is the founding member of Atlantic Chamber Ensemble, and has dazzled critics with her energetic and imaginative performances. comprising Sam Dorsey, Cliff Morris, John Boyles, and Todd Holcomb, comes from the Tidewater Guitar Orchestra, and is one of the only orchestras of its kind in North America. The ensemble’s singular sound incorporates instruments from the South American guitar orchestra— the requinto (soprano guitar) and baja (baritone guitar)—to extend their musical range and create a fresh take on the traditional sounds of a string quartet. Delight in a gorgeous concert of works by Debussy, Falla, Bernstein, and Scarlatti, as well as original pieces composed for Tidewater Guitar Quartet. Saturday, February 22 at 8 p.m.
Saturday, October 26 at 8 p.m. I Draw Slow Appalachia meets the Emerald Isle with the energetic Dublin ensemble I Draw Slow. Fusing American folk and Irish storytelling traditions, I Draw Slow is shaking up the alternative countrybluegrass music scene with their thoughtful lyrics, close harmonies, and innovative instrumentation with guitar, fiddle, claw hammer banjo, and double bass. $30 Saturday, April 4 at 8 p.m.
Saturday, November 23 at 8 p.m.
* Individual tickets go on sale August 1. ** Subsciptions on sale now—Purchase using the order form in this brochure. The Community Bank of the Nation’s Capital. Music, Dance, and Theater Presented by Local Arts Organizations Each year, these local arts organizations present a vibrant program of performing arts on the stages of the Hylton Center. Officially known as Arts Partners, these outstanding organizations are based here in Prince William County and the City of Manassas, and are evidence of the extraordinary talents and resources that exist in our area. Subscriptions are available for Manassas Chorale, Manassas Symphony Orchestra, and Prince William Little Theatre. Visit or call the Hylton Center ticket office to subscribe at 703-993-7700. For information about subscriptions to the Manassas Ballet Theatre, please visit manassasballet.org or call 703-257-1811. Magical melodies find their way from NYC’s Great White Way to Merchant Hall in this showcase of famous Broadway tunes. The full 100-voice Chorale, its smaller Ensemble, and the top choirs from select local high schools perform favorites from a variety of musicals in this sensational season opener. Saturday, October 12 at 7:30 p.m. The MSO season opens with David Pedraza, principal viola of the Symphony of the Americas, performing William Walton’s Concerto for Viola. Also included, Florence Price’s Symphony No. 1 in E minor, the first symphony written by an African American woman to have been performed by a major American orchestra. Saturday, October 26 at 7:30 p.m. Usher in the holidays with this beloved family concert! George Pekarsky, high school violinist and concertmaster of the American Youth Philharmonic, performs Sarasate’s captivating Carmen Fantasy. The concert concludes with the Light and Music Show Spectacular! Saturday, December 7 at 3:30 p.m. The MSO showcases three great American composers: Aaron Copland, Leonard Bernstein, and Howard Hanson. Copland’s Quiet City evokes New York in the early 20th century, while Bernstein’s Symphonic Dances from West Side Story captures NYC in the mid-fifties. Capping the concert is Hanson’s Symphony No. 2 (“Romantic”), the quintessential American Symphony. Saturday, March 7 at 7:30 p.m.
MBT performs a sultry night of dance set to contemporary and classic jazz tunes, a collaboration with the Kim Reynolds Band and vocalist Mark Luna that blends contemporary choreography with jazz standards, original jazz works, and vocal stylings. MBT is the largest dance company in Northern Virginia. October 18–19 at 7:30 p.m. / October 20 at 3 p.m.
Sweet Clara, naughty Fritz, dancing dolls, Drosselmeyer, and the Nutcracker Prince embark on a dreamy journey of fantasy and sweets. Featuring the international company dancers of MBT, plus an ensemble cast and the Manassas Ballet Theatre Orchestra. December 18–22 at 7:30 p.m. December 21–23 at 3 p.m.
Manassas Ballet Theatre presents a ballet blanc widely thought of as the first ballet without a storyline. The MBT company is accompanied by the Manassas Ballet Theatre Orchestra in a program of both original and classic ballet. March 13–14 at 7:30 p.m. / March 15 at 3 p.m. The season closes with piano soloist Joseph Kingma playing Beethoven’s dramatic Piano Concerto No. 3 in C minor. Advanced string players from local schools join the MSO for a finale of Antonín Dvořák’s glorious Symphony No. 9, “From the New World.” Saturday, May 9 at 7:30 p.m.
MBT’s season closes with the sensational and spicy, classical ballet Don Quixote. Set in Barcelona and known in the ballet world as “Don Q,” this work incorporates all of the critical elements—longing, love, loss, and in the end, a wedding! The Manassas Ballet Theatre Orchestra accompanies the program. May 15–16 at 7:30 p.m. / May 16–17 at 3 p.m. Embrace the spirit of the season through joyful carols and festive songs. Familiar tunes and exciting, new arrangements are accompanied by the Chorale’s live orchestra. Add candlelight selections and you’ve got an evening to remember! Saturday, December 14 at 7:30 p.m.
With equal measures of pluck and positivity, little orphan Annie charms her way into everyone’s hearts in a fun-filled adventure for the whole family. Based on the popular comic strip by Harold Gray, Annie has become a worldwide phenomenon and was the winner of seven Tony Awards. July 19–20, 25–27 at 8 p.m. / July 20–21, 28 at 2 p.m. This play centers around a military tribunal before which four Nazi judges stand accused of crimes against humanity. Issues at the forefront of this trial reverberate through history and challenge humanity to this day. October 18–22 at 8 p.m. / Oct 13, 20 at 2 p.m. The Manassas Chorale and the Voices United Workshop Choir combine resources for a breathtaking evening of sacred music. Led by Artistic Director Becky Verner and a nationally-known guest clinician, over 150 singers will raise the roof in this celebratory program. Marvel at the united effort of over thirty choral organizations joining together in the state-of-the-art Merchant Hall. Saturday, March 21 at 7:30 p.m.
Join the Manassas Chorale and the Greater Manassas Children’s Choir in a showcase of music from across the decades. Listen for your favorites in this musical time machine of melodies and harmonies that have stood the test of time. Friday, May 29 at 7:30 p.m. When Charlie Brown becomes overwhelmed by the materialism of the season, Lucy suggests he direct the school Christmas pageant. Accepting the challenge, Charlie Brown works to find the true meaning of Christmas. December 13, 20 at 8 p.m. / December 14, 21 at 7 p.m. December 14–15, 21–22 at 2 p.m.
CAPAC ushers in the holidays with a celebration of the birth of Jesus Christ wrapped in a modern and soul-stirring classic. More than just a musical, this joyous theater experience depicts Christmas through the lens of AfricanAmerican culture, articulated by Langston Hughes’ poetic narrative, scripture, diverse music genres, and evocative dance. This year introduces the CAPAC Community Choir to this family-friendly production. Friday, December 6 at 7:30 p.m.
Simplify your life. Be a Lifetime Member through monthly payments! The Hylton Center is located in Prince William County on the campus of George Mason University, just four miles south of I-66 via exit 44.